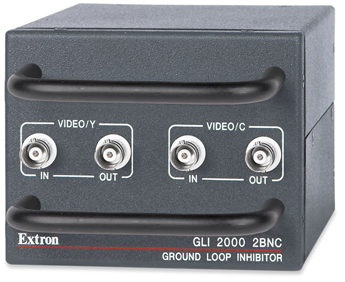 The Extron GLI 2000 2BNC heavy duty Ground Loop Inhibitor offers a reliable, simple solution for AV system ground loop problems. The GLI 2000 2BNC’s compact design and rugged construction make it an ideal solution for staging applications where mobility and ease of handling are required. It comes standard with protective rails that guard connectors from damage. This flexibility in design allows it to be mounted virtually anywhere, including in a rack or road case, near the projector, or in/under furniture.